I've written a few articles on the Grey Knight minis as I succumbed to newcodexitis and decided to build a GK force. Well that and as I have an IG army and with the Knights being elite and therefore low in numbers it would be easy to do. We have the following posts available for your reading pleasure. A cheap and easy Rifleman dreadnought conversion. First impressions on the new Grey Knight sets. How to cheaply bulk out your Grey Knight forces with the combat squad set. I wanted to start cross linking my MWC posts to this blog so it keeps busy. Here's my first post back in April. Had another game with the knights. Another 1,000 pointer and I played the same list as I didn't have time to change anything and add in the new models I picked up. Playing against blood angels with a reclusiarch and 2 sanguinary priests supporting 3 10-man assault squads. Capture and control, pitched battle, I had turn 1. 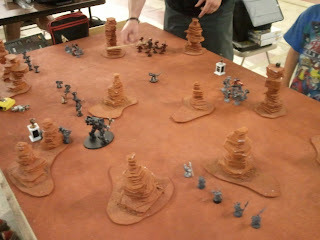 Turn 1 didn't make much difference as Justin plays this as a full reserve army. So, turn 1, Grey Knights hang out, exchange stories. Turn 1 Blood Angels, descending I guess. Turn 2, Grey Knights throw out some warp quake, mill around a bit. Turn 2 Blood Angels, still descending. Turn 3 Grey Knights. Warp Quake, and OMGWTFBBQ, where are the bad guys? Turn 3 Blood Angels. Thud, all three squads land. A good distance away because of the warp quake. All come in safe and run forward. Fortunately, being a bit late means they were in too much of a hurry to get their nerd rage ability going. Turn 4 Grey Knights. Realized I was forgetting to roll for the Paladin, at least he arrives but too late to be an extra hazard for the opponent. OK Cool, lots of targets, open fire. The rifle dread with its 2 twin linked, Strength 8 autocannons of doom, and a total of 2 Psycannons and 13 storm bolters are all in range, 34 shots. And they kill one dude. Sensibly, they all back up a bit. Turn 4 Blood Angels. All the squads jump forwards. The first squad open fire with bolt pistols on the interceptors near them and kill one guy. I take out the one closest to them. Now they are out of assault range. The other squads watch this and leave off the shooting. Turn 5 Grey Knights. OK lads, lets stop them getting the assault. All the weapons open fire. This time an incinerator, 3 psycannons (1 as heavy, 2 as assault), 17 storm bolters, 1 heavy incinerator, the rifle dread, and a bolt pistol. Forty seven shots plus a total of 7 more hits from the 2 incinerators. I killed 3 guys. What the hell. But anyway, we are in assault range, pile in guys. Five Interceptors with one halberd on the justicar against 10 blood angels with Sanguinary Priest. We win 3 kills to 2 but they hold. Five strike squad with swords and the Inquisitor against 10 man assault squad with Reclusiarch. Didn't realize the IC had to be in base to base to count. OK, rule learned, now will I remember. Killed 1 each, combat tied. Five Interceptors with halberds against 10 blood angels with Sanguinary Priest. We win 3 kills to 2 but they also hold. Oh, and the Paladin is now over hanging out by their objective. And, I completely forgot hammer hand. Will I remember next turn? It would have got me a few more wounds as well. Turn 5 Blood Angels. Nothing but assaults. Knights lose a guy on the left but hold. Knight lose all but the Inquisitor and justicar in the middle but hold. Knights lose a couple of guys on the right but hold. At this stage I'm winning one held, one contested. But, turn 6 does arrive. Turn 6 Grey knights. The dreadnought doesn't have much to do so just positions for a better shot later. If I was paying any attention I would have realized he had nothing that could hurt in and would have had it tar pit a unit. Bad move on my part. I'm also lax on moving my dreadknight and move it forward so it can assault. I only move it a few inches as its more than close enough. The Paladin moves back towards the fight so he'll have something possibly to do. Assault phase, here comes the dreadknight to help out the interceptors. Except I had stupidly miss judged, should have moved the full 6", now he can't reach assault. The interceptors on the left get wiped but take all but the priest with them. The strike squad in the middle is down to just the inquisitor who holds, the interceptors on the right get wiped but take another couple of guys with them. And yeah, forgot hammer hand again. Idiot. Turn 6 Blood Angels. The sanguinary priest joins up with the reclusiarch and 3 others to kill the inquisitor. The assault squad on the right try and jump past the dreadknight to get to the objective. The strike squad defending it is about 4 inches away and in difficult terrain and they come up short. I'm still winning one held, one contested. But, turn 7 also arrives. Turn 7 Grey Knights. The Rifle Dread, paladin, dreadknight, and last strike squad all have clear shots. So we have the two TL autocannons, 5 stormbolters, and a psycannon in heavy for 18 shots, and a heavy incinerator tagging 5 guys. I kill 2 with storm bolters and 1 with the incinerator. Again, I should have been moving the dread in to fight, I also should have moved the strike squad off to assault. Bad planning. The dreadknight assaults, only manages to kill 1 and takes a wound. Turn 7 Blood Angels. The dreadknight and assault squad carry on fighting. It kills 1 and takes a wound. The other remaining squad jump in to assault getting a good enough roll to make it into difficult terrain. With the initiative bonuses of their furious charge and some really good rolling, the strike squad are wiped out by just the power weapons on the priest and reclusiarch. Which means at the very end of the game he has one objective and I have none. So, why did I lose. Aside from really crap shooting. I should have made better use of the dreadnought and brought it out to fight. I should have remembered hammerhand. I shouldn't have been so relaxed on movement. And, I should have taken control on the last turn and pulled my knights off to assault, giving me a much more even fight. Hmm, lets go back and add up the amount of shooting. 12 S8 AP4 shots, 20 S7 AP4 shots, 70 S4 AP5 shots and S6 flamer shots tagging 12 guys. And I managed to kill I think 7 guys by shooting. I wonder what mathhammer says I should have got. Two squads had feel no pain, but the S8 shots punch through that. Heavy shots, should have had 25 hits, 21 wounds, 7 failed saves with another 1 saved by feel no pain. The storm bolters should give 46 hits, 23 wounds, 8 failed saves and another 3 saved by feel no pain. The incinerators should have generated 10 wounds, 5 failed saves, another 2 saved by feel no pain. So averages say I get 13 when I only in fact got 7. In a small game that's enough difference to mean the special characters survived when they otherwise may have died and made things a little easier near the end. When even averages say only 1 in 10 shots is going to kill it lets you know how tough these guys are. 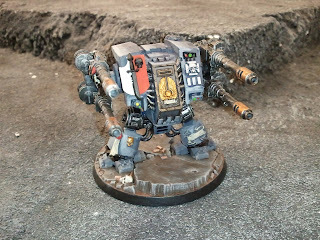 Dreadknight close combat dosen't look good either. It killed 2 guys. 7 attacks should have given me 4. Guess I need to roll my dice a bunch more, they have a few bad roles to get rid of.